The Beaver Dusters won a single game in 2012 and limped to a 2-8 season last year. Beaver 20th year head coach Mike McVay didn’t have much reason for optimism this offseason either when only about 13 players were actively participating in the offseason program. But with school under in Beaver City, there are now 28 Dusters which elates McVay. There are four starters back on both sides of the ball at the Class A school. 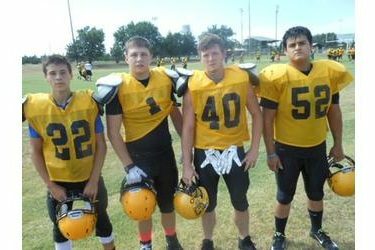 Four players are from Forgan. The Dusters will be looking for their first winning season since going 9-2 in 2010. Key Beaver Dusters are Sr. RB/LB Hadley Skaggs, Sr. QB/S Andrew Jesko, Jr. T Dee Alston (Forgan), Jr. WB/DB Cody Mathews, Sr. and TE/DE Jacob Hobgood. McVay says his junior and freshman classes are strong in numbers. Beaver was featured during the Sportsguys Wednesday morning on 1270 and kscbnews.net. The Dusters have four different opponents this year after some schedule. class, and district shuffling. Syracuse, Kansas, Burns Flat, Sayre, and Thomas replace Burlington, Colorado, OBA, Okeene, and Turpin on the schedule.